Social media news releases have lots of advantages, and what’s not to like? They offer a clean, simple format that encourages companies to be clear and succinct. While multimedia content can be added to any press release, SMNRs are much more likely to incorporate images and video. It is easy share and repurpose the information in the releases and in many cases they are strong enough to stand on their own as an ongoing resource. 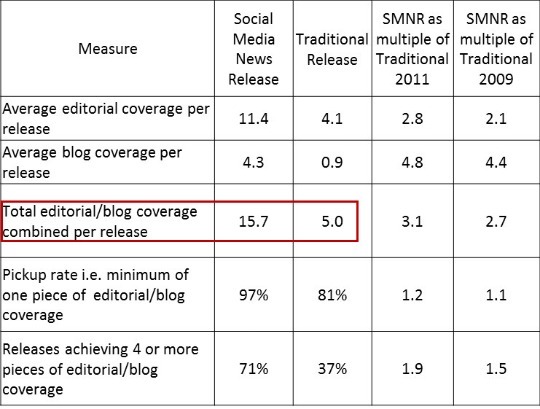 That all sounds great, but do social media news releases actually generate more media coverage? According to research from the UK’s RealWire, they do. After an interview with Shel Holtz on the value of press releases RealWire CEO Adam Parker revisited some previous research to see how SMNRs are faring against traditional press releases. There are any number of things that influence the success of a press release, most of all the content of the announcement itself and its relevance to particular news outlets. And as statisticians like to say correlation does not imply causation. But the data is certainly encouraging and it is good to see evidence that social media press releases are performing well.